It is the simple pleasures in life that are the best. Just watching the pure enjoyment of my children eating such a delicious, natural & nutritious breakfast, is one of my greatest pleasures. Seeing the looks of pure Happiness. Watching them grow strong & healthy. They are so smart and emotionally intelligent. I love them so. We have a healthy & bright future ahead of us. Filled with all the Love, Happiness & Joy we could ever dream of. I am blessed to be sharing it with you. Thank you for all the abundance you have given me, so that I may return it to you. 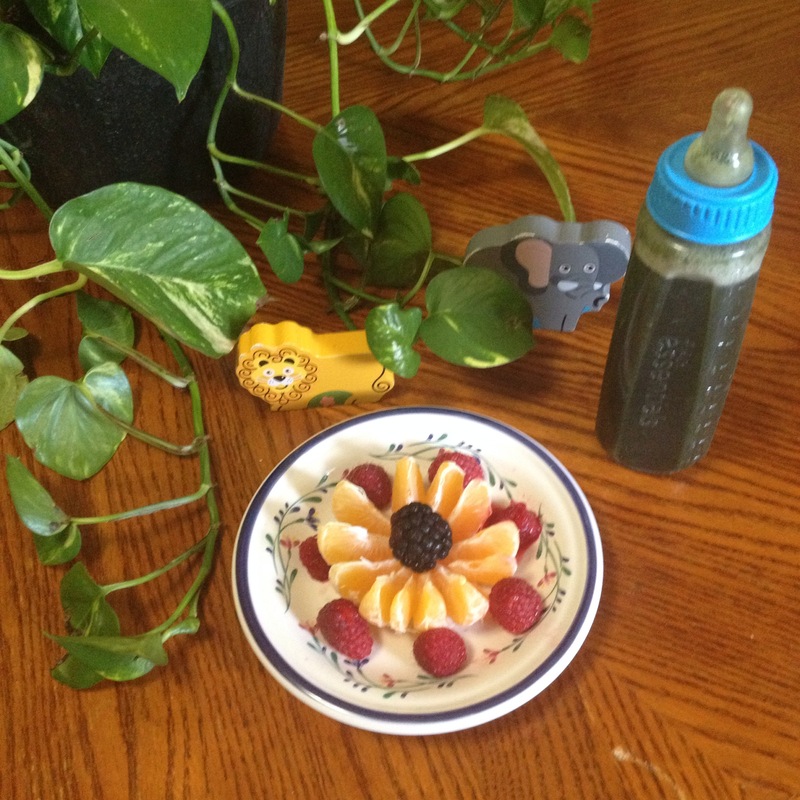 Simple Breakfast of tangerines, berries & green smoothie, made of bananas, Hemp Seeds & Chlorella. This breakfast contains ALL the vitamins, minerals, proteins & essential fatty acids. Seaweeds are the most nutrient dense foods on the planet. They are ancient healers having existed since the beginning of time and have collected everything that has ever existed on this planet Earth. From what was washed down from the tops of the mountains, across the lands, and through the waters to the bottom of the ocean floor; seaweed has seen it all, and has evolved to thrive on everything. Check out this recipe to incorporate seaweed into your everyday diet! Seaweeds are a complete food containing all 56 minerals and trace elements your body needs to thrive. Just like the healing and powerful crystals and gemstones of the earth, seaweeds are made of all of these exact same minerals that create the beautiful crystals and gems. Crystals and gemstones are very conscious creations, having extremely direct and intentional frequencies. They have been used for centuries for healing and altering states of consciousness. Seaweeds contain almost every mineral known! All the different minerals that make up every crystal and gem, can be found in seaweed, and thus become a part of ourselves! They are powerful healers and respond to our thoughts and intentions. They can be programmed by our consciousness. Seaweeds are highly intelligent and conscious beings that know what is good for you and the earth, and what needs to be filtered out. In fact, they do this themselves! They purify the oceans of radiation and pollutants, and they perform this same service for the human body; knowing what needs to be filtered and carried out, and at the same time nourishing us with a complete round of vitamins and minerals. Seaweeds help remove the bad bacteria from our bodies and our earth, while at the same time, giving a helpful boost to our friendly bacteria which is the key to a healthy and thriving ecosystem within and without. They can help heal virtually any disease, and even reverse the damages done, while simultaneously adding an extra healthy glow! We can save ourselves and our planet with seaweeds. Mother nature is so perfect that we underestimate just how spectacular and grand of a design the universe really is. We can align with the perfection of it all, and use it to heal and transform both ourselves and the world around us, which alters the alignment of our universe as well. Not just on a physical level; we can rise to higher states of consciousness and create our own realities at will. With the divine consciousness of the universe, as it designed our planet and all its inhabitants, lets create a world where we all thrive!